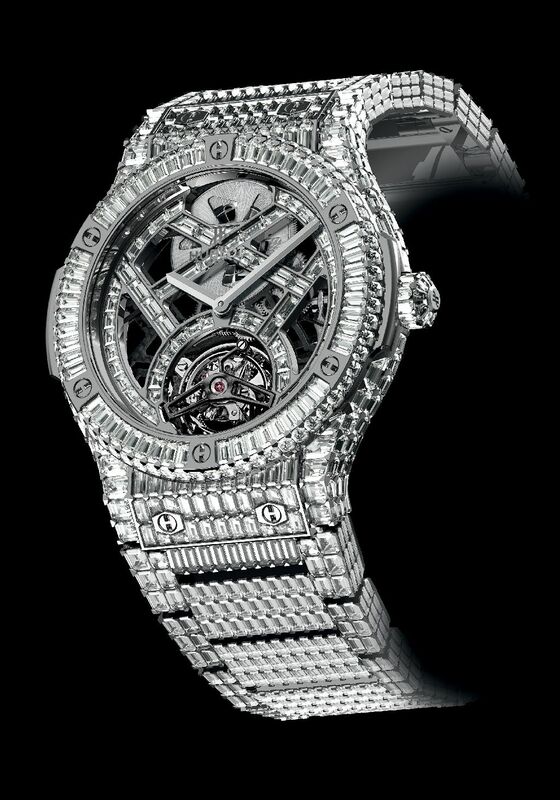 This “$1 Million” Haute Joaillerie timepiece proudly carries some extraordinary credits: 1185 baguette diamonds. 4100 hours of cutting. 500 hours of dimensional checking and quality control. 4 months’ work for the stone-setters. In total: 64 experts each in their own field, representing 11 different disciplines. That is why the Classic Fusion Haute Joaillerie “$1 Million” is made available for just 8 pieces only. 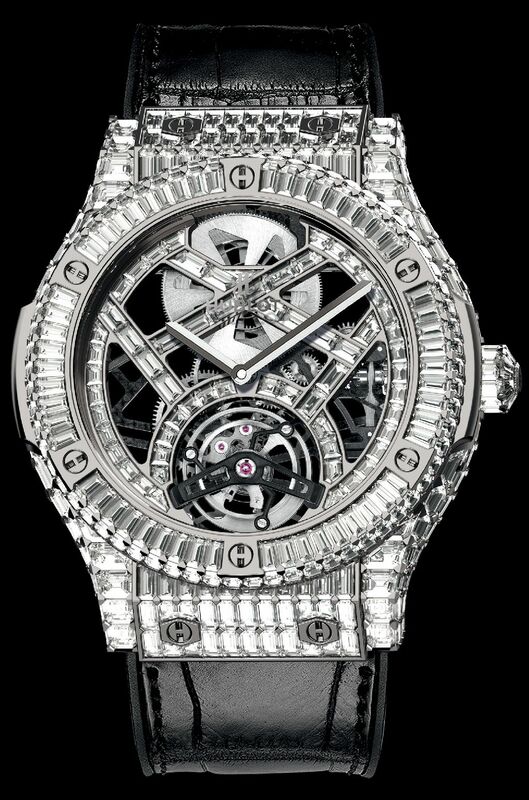 The Classic Fusion Haute Joaillerie “$1 Million” was presented by Hublot at BaselWorld 2013. A watch whose skeleton tourbillon movement, developed and produced entirely in the Hublot Manufacture workshops, is fully set with baguette diamonds, including its openworked dial, designed to reveal the fine mechanics. A precious yet refined piece, this watch also makes a striking visual impact through its modern graphic design; a challenging feat in the world of Haute Horlogerie Joaillerie. Blending traditional craftsmanship and a 21st Century creative vision for watchmaking, the creation of this piece required 1185 diamonds, all sought out, brought together and purchased specially for this purpose – they come from Yakutsk, Eastern Siberia (Russia). One of the major difficulties encountered by the stone-setters was setting the rounded flanks in both axes, on the face and edge of the watch case middle. As a result, there are 3 rows of stones to conserve the elegant design of the case, with a total weight of 17.39 carats from 322 baguette diamonds – the bezel has 120 diamonds weighing a total of 5.77 carats, the case middle 122 diamonds weighing 7.24 carats, the two end-pieces 66 diamonds weighing 3.77 carats, and finally the crown, which alone has no fewer than 24 diamonds with a total weight of 0.61 carats, a fairly extraordinary adornment. For the baguette diamonds of the case alone, a 15-strong team had to perform 1800 hours of cutting and 200 hours of dimensional checking and quality control. The openworked dial, which has adopted the original shapes of the movement, is also stone-set, including the minute track, which further intensifies the overall shine. It features a total of 62 baguette diamonds, with a total weight of 2.31 carats. Finally, the bracelet has 791 baguette diamonds, which required a 25-strong team to perform 2300 hours of cutting and 300 hours of dimensional checking and quality control. Finally, it took in total 300 hours of stone-setting, plus the machining (more than one month’s work), the finishing including polishing, rhodium-plating (around one hundred hours), the assembly and the water resistance test (30 metres). In total, Salanitro in Geneva, a long-standing partner of Hublot for Haute Joaillerie pieces, worked for just over 4 months on this piece; to this end, 24 people, all experts in their field, harnessed all their know-how, representing 9 different disciplines. This watch can boast a power reserve of 120 hours, and just 8 pieces will be produced, because of the complexity and exclusivity of its production process.